Ameranthropoides loysi (De Loy's Ape) is allegedly a large primate encountered by François De Loys in South America. Apart from testimony of claimed eyewitnesses, the only evidence of the animal is a photograph. 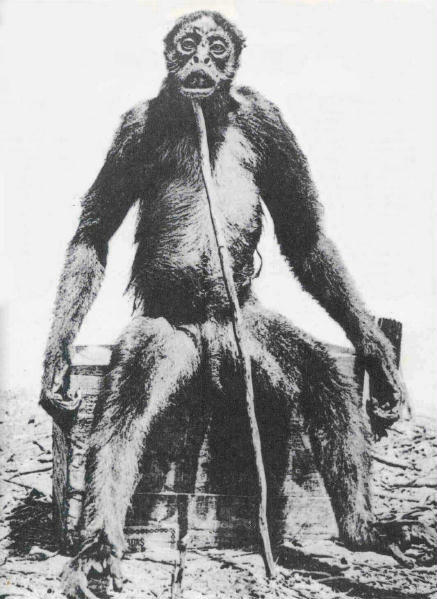 Controversy continues about the authenticity of the animal, with critics contending that the de Loys' Ape is a hoax and that the photograph shows only a posed spider monkey carcass, though cryptozoology enthusiasts and a few others support the notion that de Loys did indeed encounter an unknown primate. François de Loys, a Swiss oil geologist, led an expedition from 1917 to 1920 to search for petroleum in an area in the border between Colombia and Venezuela, primarily near Lake Maracaibo. The expedition was unsuccessful, and furthermore suffered greatly due to disease and skirmishes with natives; of the 20 members of de Loys' group, only four survived. According to de Loys' later report, in 1920, while camped near the Tarra River, two large creatures headed to the group. Initially, de Loys thought they were bears, but then noted that they were monkey-like, holding onto shrubs and branches. The creatures – one male, and one female – seemed angry, said de Loys, howling and gesturing, then defecating into their hands and flinging feces at the expedition. Fearing for their safety, the expedition shot and killed the female; the male then fled. De Loys and his companions recognized that they had encountered something unusual. The animal resembled a spider monkey, but was much larger: 1.6 meters tall (compared to the largest spider monkeys, which are just over a meter tall). De Loys counted 32 teeth (most New World monkeys have 36 teeth), and noted that the creature had no tail at all. They posed the creature by seating it on a crate and propping a stick under its chin. After taking a single photograph, de Loys reported, they skinned the creature, intending to keep its hide and skull. Both items were later abandoned by the troubled expedition. Mister Montandon said that the monkey had no tail. That is for sure, but he forgot to mention something, it has no tail because it was cut off. I can assure you this, gentlemen, because I saw the amputation…. Some time later I and Loys went in another region of Venezuela: in an area called Mene Grande. He always walked along the side of his monkey, who died some time later. De Loys decided to take a 'photo and I believe that Mr. Montandon will not deny it is the same photograph that he presented today. [in 1929 Montandon presented the Ameranthropoides in a public lecture]. More recently during a visit to Paris my astonishment was great visiting the Museum of Man. On top of a monumental scale, filling the back wall, there was a huge photo with the caption: “The first anthropoid ape discovered in America.” It was the photograph of de Loys, beautifully modified. The plants were no longer visible in the background, and it was not possible to understand on which kind of box the monkey was sitting. The trick is done so well that within a few years the monkey will be over two meters high [...]. Finally, I must warn you: Montandon was not a good person. After the war he was executed because he betrayed France, his homeland. The Actual Photograph of Ameranthropithecus.